They delivered the flowers at the door, three large boxes, including three bridal bouquets, a corsage for the father of the bride and an extra-large bouquet for the bride herself. She took one look and started to hyperventilate. ‘What’s wrong?’ said bridesmaid number one, perched on a stool, her hair under the deft hands of a mobile hairdresser. The discussion continued through the smell of baked croissants, a morning snack to sop up the glass of champagne that was meant to ease the tensions. In time, the bride’s sister nicked out to the florist, hopeful of buying a bouquet of less exotic flowers to replace the shower head. She came back with yellow buttons and green leaves. 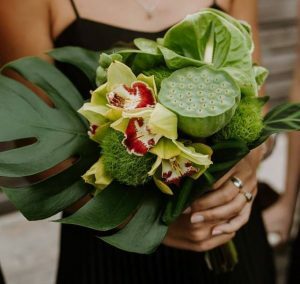 But no matter how they tried they could not pluck out the offending bloom without destroying the look of the bouquet, which had been designed by one of Melbourne’s top florists to blend with the theme of the day. A decor to inspire people with the feel of Mount Fuji in Japan, a mountain that had inspired the bride during one of her visits. Its tall trees, white peaks and rocky outcrops. The florist had promised a bouquet of flowers, green with a touch of gold and clumps of moss, with no idea that the offending flower would turn into the stuff of nightmares. When she was a little girl the bride developed a phobia of the statue on top of the church near her home. This statue of the blessed Virgin Mary in gold on top of Our Lady of Victories Basilica. A gold woman who held aloft a sceptre and orb in one hand and her baby Jesus son in the other. The bride at six years of age could not sleep then, not that she said as much to anyone, not until later when she talked of her fear of things that might crawl out of the offending flower when she remembered the gold woman on the church. Every night the six-year-old bride had stood at her window and craned to see the statue, visible above the trees and houses that separated her house from the church. Every night she wondered. What if the gold woman took her broom and came to visit the bride? What if the gold woman came with her broom into the bride’s house and swept up the corridor, up the stairs and through the bedroom door to the then six-year-old bride as she stood at her window? What if the gold woman with her broom was not the helpful cleaning woman the bride’s father had suggested but was instead a witch with cracked and crooked teeth and black eyes? What if the gold lady was a witch with a long nose and a hairy wart on the end. And what if the gold woman’s broom was in fact a witches’ broom and came with the most repulsive smell, the smell of putrid ponds that were filled with dead frogs and the witch woman wanted to take the bride, a girl of six years old and terrified on her broomstick out into the night to the place where witches take children who have not gone to sleep in their beds at night as they should.? Children who instead stood by the window and waited to catch out the witch woman and her broom stick and needed to be removed otherwise they would give the game away. Then all the world would know about the bad smell that came from the compost bin in the kitchen, the bad feeling that came over the bride at the sight of the shower hose flower belonged to the secret place of witches and she would never be safe again. I have just become aware of a condition called tryptophobia which maybe what the bride suffers. It causes stress for people to look at organic circular or hole patterns and the offending plant is a perfect example. I personally, enjoy the visual effect of these patterns. I wonder what the phobia of the old woman with the broom is? Amazing stuff and yes, i’ve encountered this type of fear of holes and odd shapes in others. Interesting too that it might well be a biological revulsion that is evolutionary in its protective function. We learn something new every day. Thanks, Karen. That was the first thing I thought about when I saw this article. Both my daughter and I have tryptophobia and could not have carried that flower either! Yuck, I don’t even like looking at the picture. For all my parents’ failings the one thing they never did was try to instil a belief in fantastical creatures or people. Not the tooth fairy, not the Easter bunny, not even Santa; I always knew these were pretend. The only person I was expected to fear was God: The fear of the LORD is the beginning of wisdom (Proverbs 9:10). Of course I wasn’t supposed to be afraid of God but try explaining the distinction to a five- or six-year-old. I’ve always struggled with the notion of a healthy fear. Of course God didn’t need to clamber down a ladder to get to me. He was a constant in my life, constantly watching, constantly waiting for me to fail or stop trying. I was supposed to be reassured by his presence but I never was. Ah well, when our children tried to understand the nature of God and all things religious i had a tendency to liken the business of gods and saints to fairies and the like. So there are clearly links. Thanks Jim .